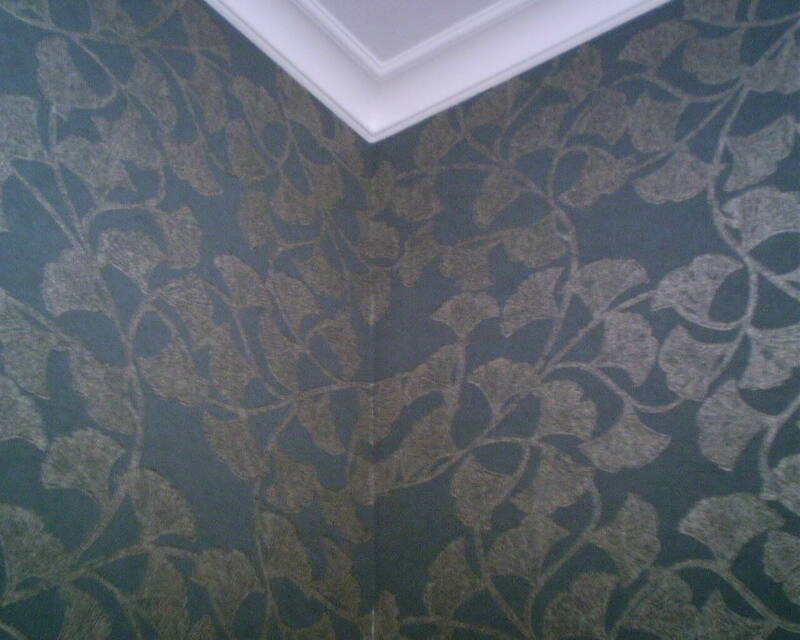 The client loved this wallpaper, which had been used in their previous home. She had only a little left – a partial roll 20.5″ wide and less than 14′ long. 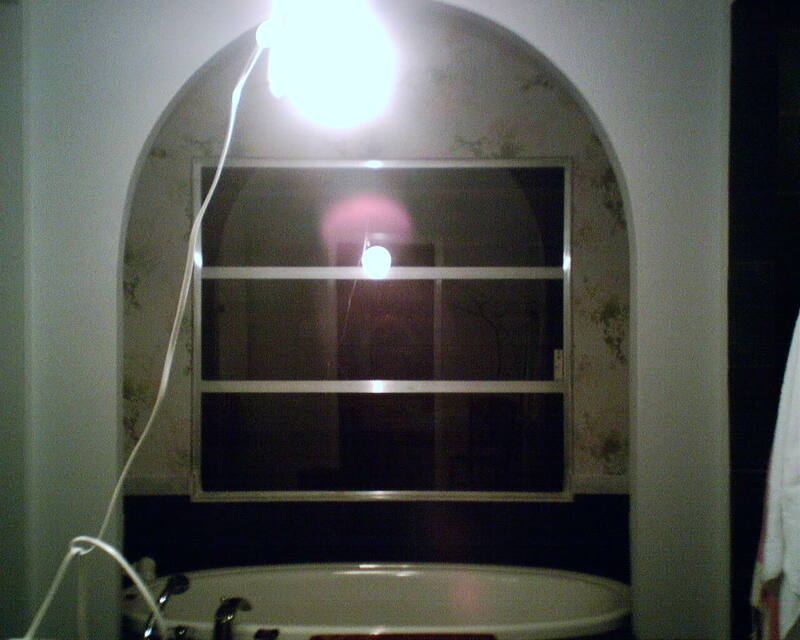 She asked if I could use it to paper this arched wall behind the garden tub in the master bathroom. I was up to the challenge! I spent at least an hour and a half measuring, figuring, plotting, and positioning, and – yes indeedy – got the space covered with wallpaper. 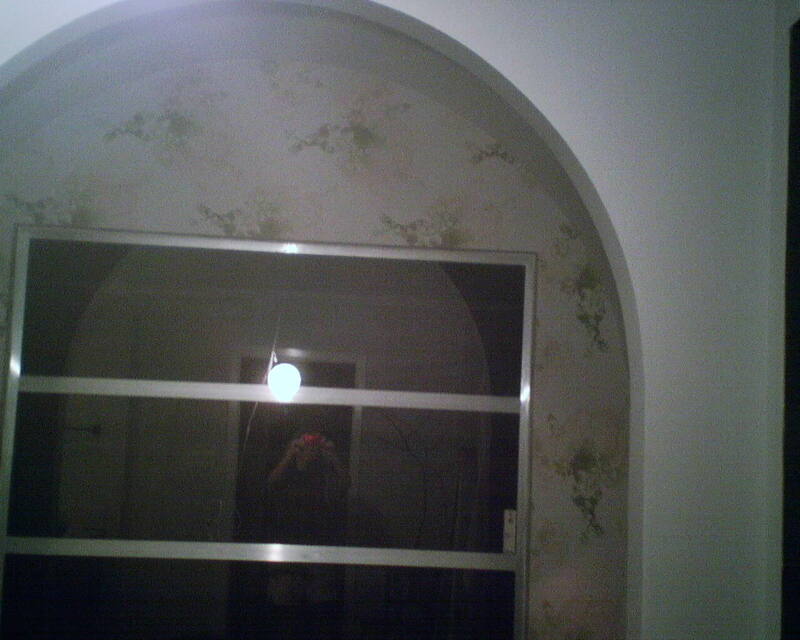 I railroaded (ran horizontally) the strip above the widow, centering a “sun” on the pattern at the peak of the arch. A curtain will cover the area directly above the window. The sides were about 15″ wide, so here I ran strips vertically. This is a LOT harder than it sounds, since I wanted to have a design element land at the point where the vertical strip intersected the horizontal strip, to disguise the mis-match. Compounding the math and the positioning are factors such as the inward curve of the wall, which made it hard to predict where a particular part of the design would fall, and the 2 1/4″ return (inner surface) of the window, which also ate up part of the design. I made sure I measured everything multiple times, and held it up to the wall before cutting, and I was more concerned with covering the wall space than centering the pattern on the two side walls. Since the wallpaper was 20.5″ wide, and I only needed 15″ width for the side walls, I had a long narrow strip left over, which I cut into two 2 1/4″ wide strips and pasted into the upper return of the window ( below where the curtain will go). In the end, every surface was covered, and the client will be very pleased to have her private bathtub surrounded by this cherished pattern. Here’s a “paintable textured vinyl wallpaper” that I installed today on an accent wall in a guest bedroom in the Upper Kirby neighborhood of Houston. These papers are OK if left white, but are meant to be painted. Then they look great when finished with a glaze, which sinks into the recessed areas and wipes off the raised areas, leaving a two-tone effect. 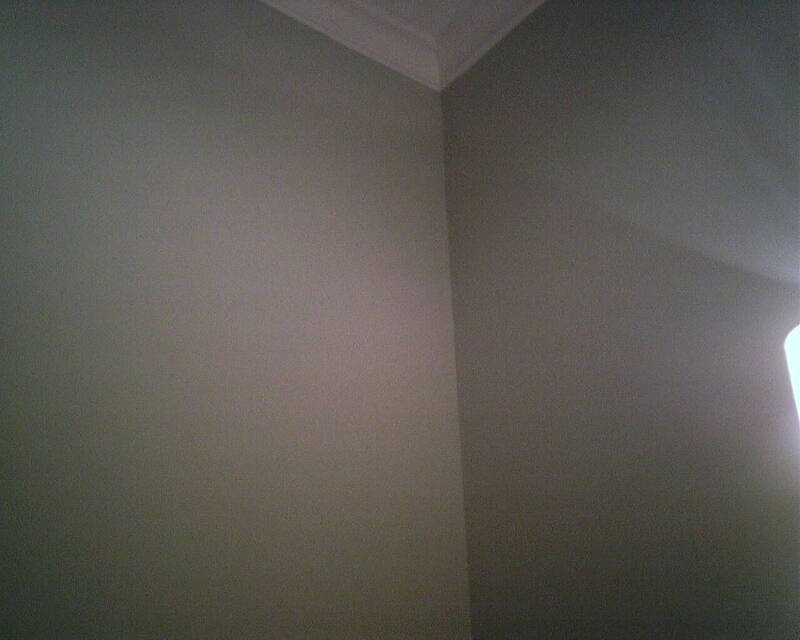 As you can see, light coming at an angle accentuates the texture. 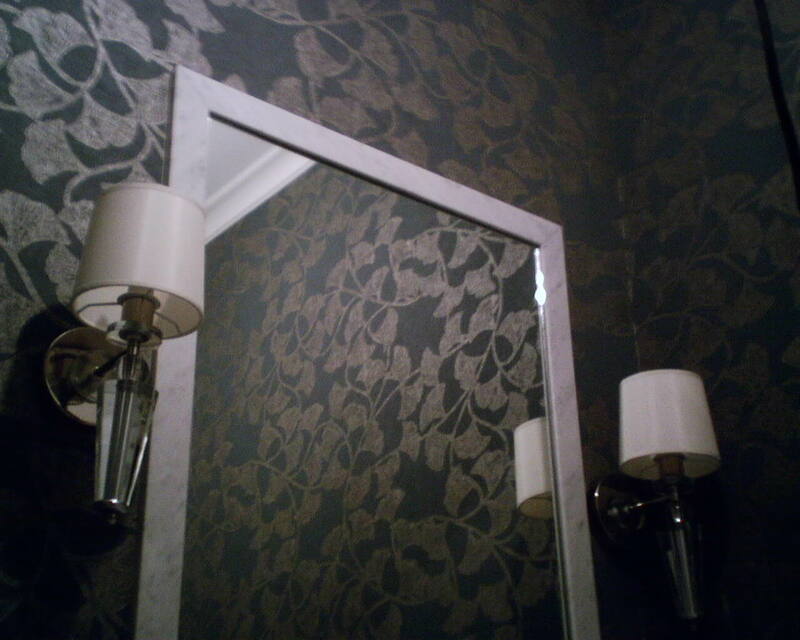 Here are some before-and-afters of the wallpaper I hung today, in a powder room in West University Place. It was a gold metallic on a grey background, elegant but not stuffy, updated but not too trendy, so it will stay stylish for many years. The homeowner, a mother with three young children, mostly likes the dark color, which she hopes will hide her kiddies’ finger prints! This is # 839-T-721 by Thibaut Designs. 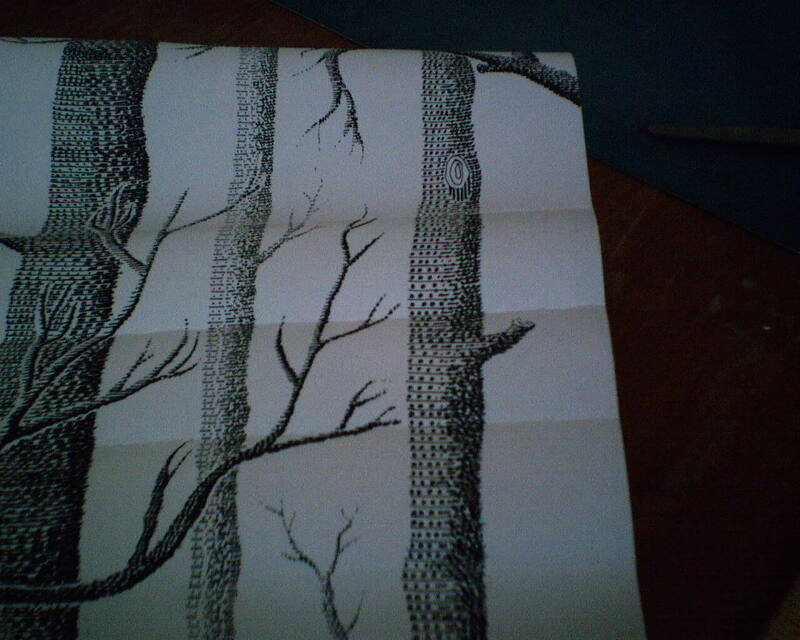 It’s the first paper on a non-woven substrate that I’ve encountered from Thibaut. It was very thick and stiff, and I found it somewhat contrary to work with, not wanting to conform to corners or turns, and not malleable like patterns printed on paper substrates. Nonetheless, the walls were flat and I didn’t have any intricate cuts to do, and it went up nicely. The clients loved it. Finding Just What You Want at an “In Stock” Store – NOT! I got a call from a gal today, asking if I knew any places that had in-stock wallpaper, where she could shop and take wallpaper home the same day. I was about to tell her the (very) few places I know that still have wallpaper in stock, but first asked what she was looking for. She said she knew exactly what she wanted, but wanted to get it ASAP, and thought that a store that had paper in stock would be sure bet. She didn’t want to have to order from a book and wait for the paper to be shipped. I tactfully explained that she would have a MUCH better chance of getting what she wanted if she went to a store that has selection books and that special-orders paper. The thing she didn’t realize is, there are tens of thousands of wallpaper patterns on the market, and a retail store is only going to carry a hundred or two. If you just want a pretty pattern, you might find something to suit you. But the chances of a retail store stocking a specific pattern you have your heart set on is pretty slim-to-none. Yes, it may take a few weeks for your wallpaper to arrive, but you will have a much, much broader selection, and you will find exactly the perfect pattern for your room. I hung wallpaper in this breakfast room / kitchen in a 1930 home in the River Oaks neighborhood of Houston two years ago. The wallpaper and interior design work came from Venetian Blind & Floor, near the Rice Village shopping district, a very good place to buy carpeting, wooden flooring, tile, countertops, drapes, and other decorating needs. Their huge built-in refrigerator died recently, and was replaced with a really tiny one. 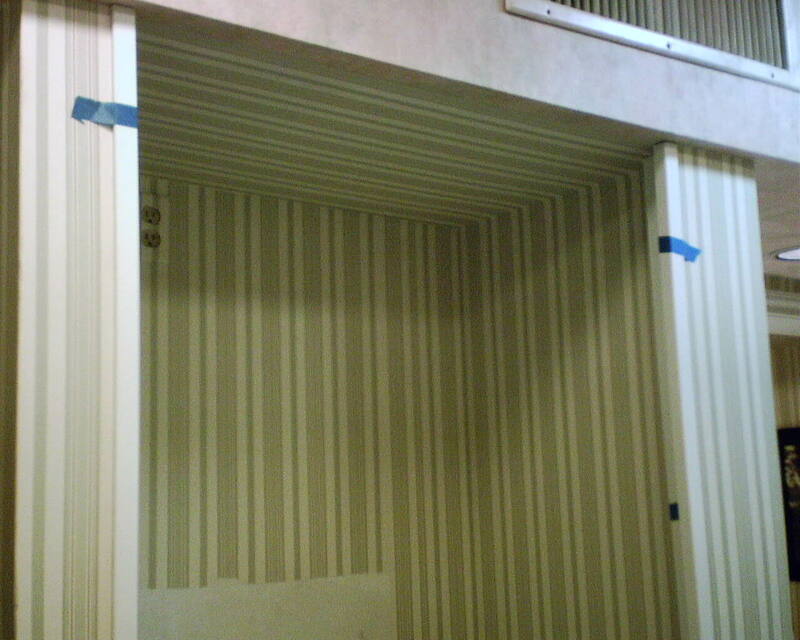 Since the small refrigerator doesn’t fill the alcove, all the unwallpapered space inside the alcove shows. So, with the less-than-one-double-roll-bolt of left over paper, I measured, split, spliced, plotted, and pasted, and managed to get paper on the side walls and on the 8″ on either side of the back wall that the new refrigerator didn’t cover. 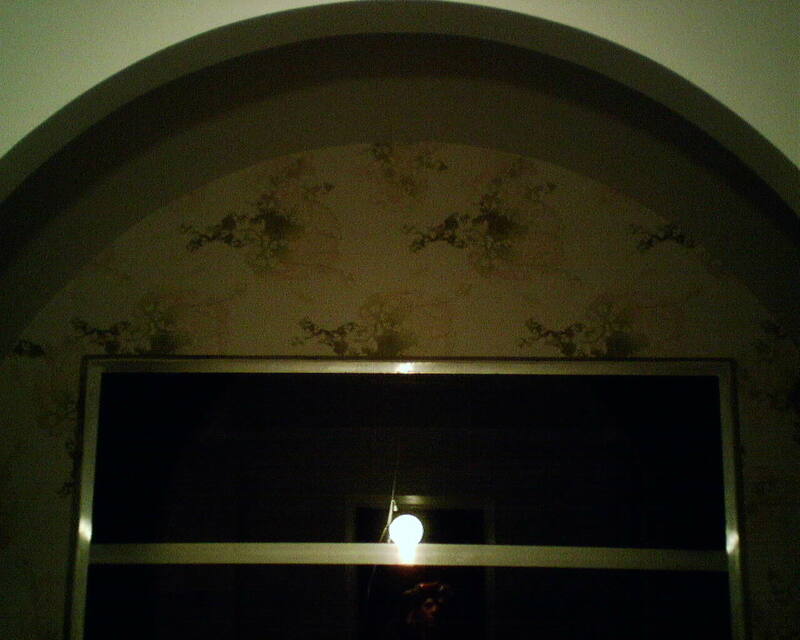 I wouldn’t normally put wallpaper on the top of the alcove, but since that area was not painted, and since the original wallpaper recessed a little into that area, there pretty much was no option but to put wallpaper there, too. I matched the stripes on the ceiling to the stripes on the two side walls. 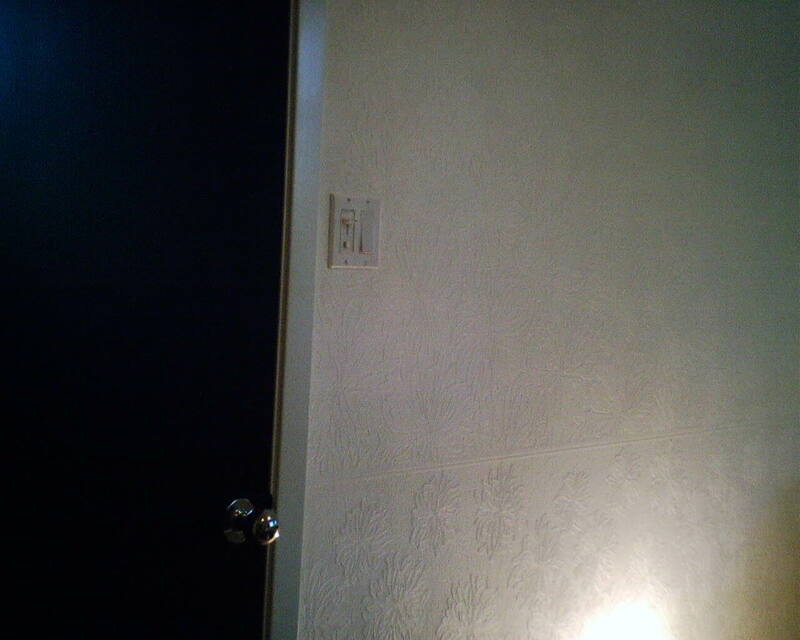 The stripes on the back wall could be matched in one corner (not shown), but in the second corner (shown in the last photo), there had to be a mis-match. 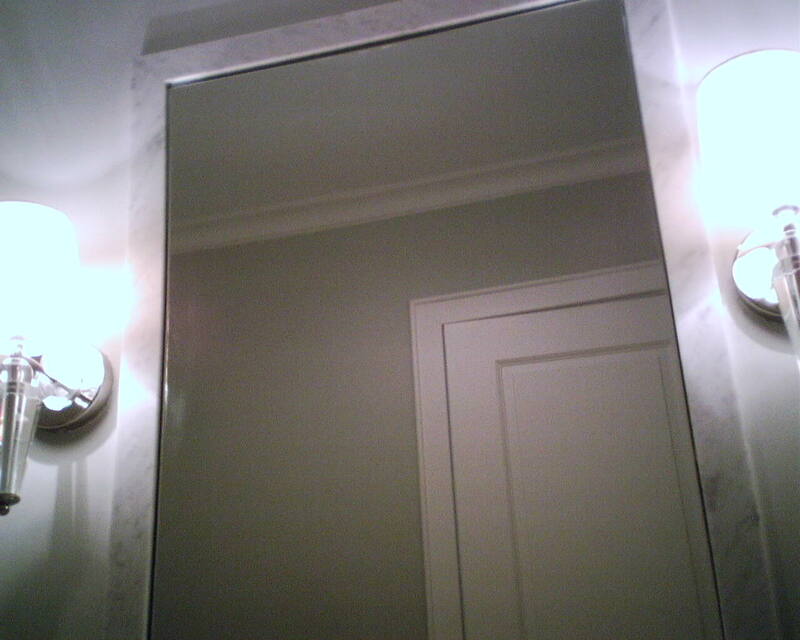 A corner is a good place to put a mis-match, especially with a stripe, as it won’t be noticed much. 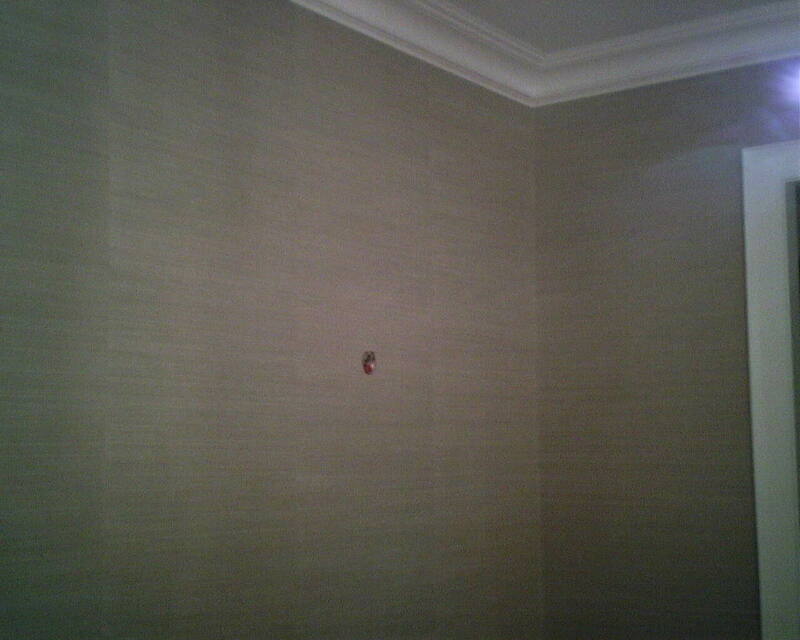 Also, since we were running out of wallpaper, there is a mis-match on the back wall, near the right corner (shown in photo). I think I disguised it pretty well. Can you find it? Note: The wallpaper doesn’t go all the way to the floor because the refrigerator will hide that part – and because we simply didn’t have enough paper! The blue tape is holding up white corner molding that we glued to the outside corners of the alcove. It will be removed once the adhesive is dried. Twice this week, I was unexpectedly treated to lunch. 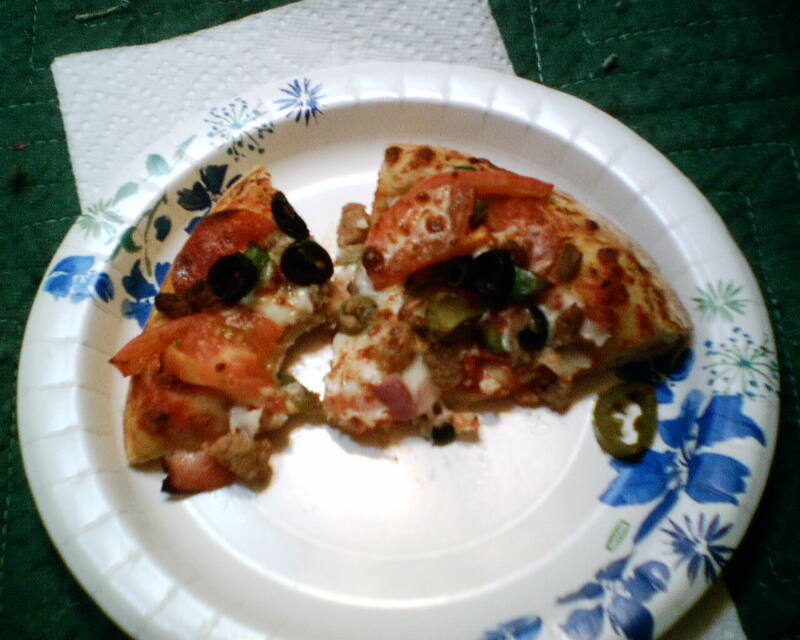 On Friday, the homeowner gave me Domino’s, and on Saturday they shared their box of local mom & pop pizza shop. 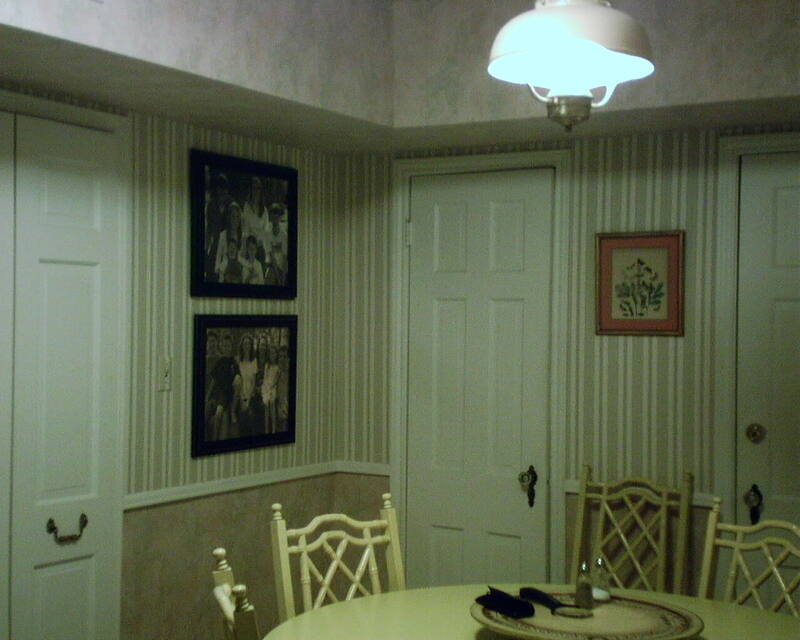 Photo 1, just a brown dining room. I skim-floated this wall to smooth the heavyish builder’s texture, sanded, primed, and then hung the beautiful paper you see in Photo 2. I was unable to get a distant shot, and this pic doesn’t do the wallpaper justice. The background is a beautiful murky aqua, and the print is a metallic burnished gold. The homeowners loved it. I was able to squeeze them in and get their dining room done just in time for the family coming for Thanksgiving Day dinner. This pattern is called “Desire,” and is by Graham & Brown. Here is a link to a different colorway of the same pattern. 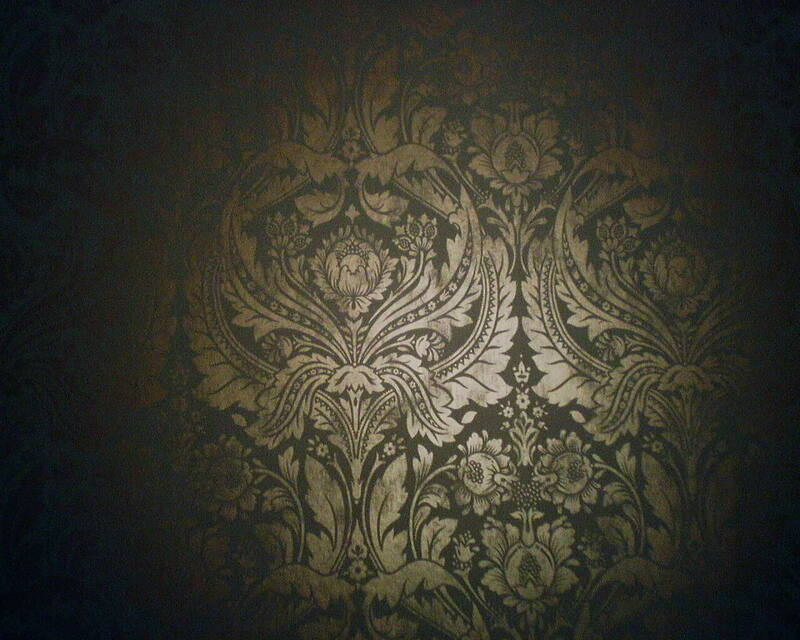 Wallpaper Spliced by Manufacturer – Unuseable! 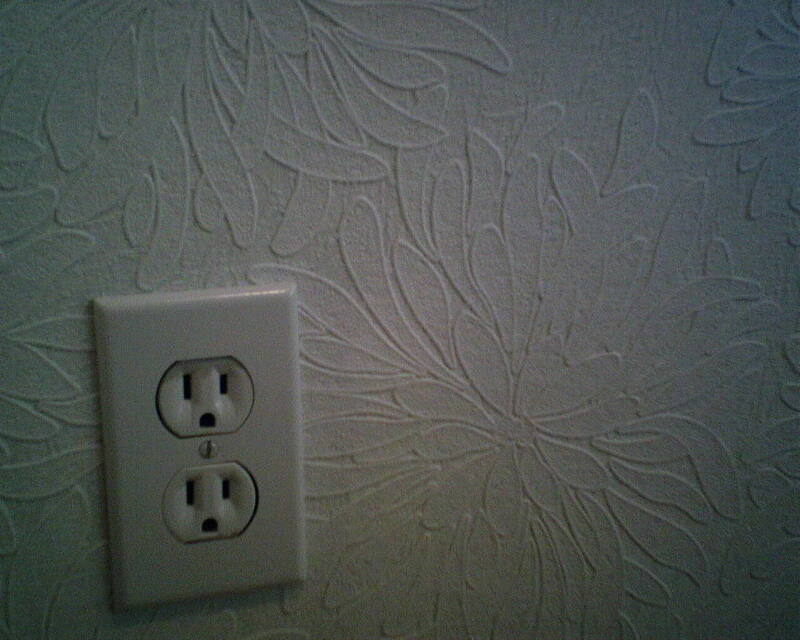 Bolts of wallpaper are supposed to contain a certain number of yards. Well, what happens if the paper runs out before the bolt is full? Many manufacturers do this – they splice in another piece. Then they stick another piece of paper on the back, to hold it all together. This is unacceptable! 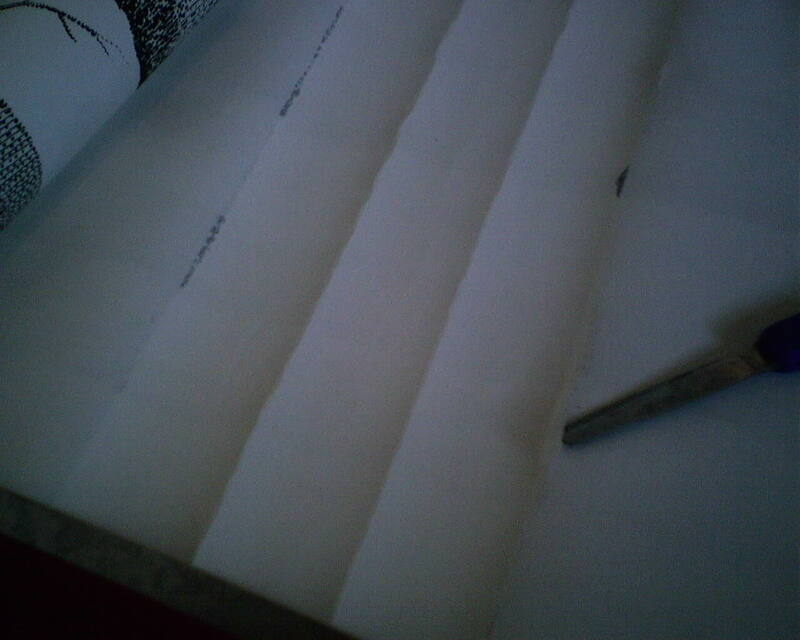 The paper “bandage” on the back is thick, and creates a noticeable bump under the paper. And you can see how damaged the front is, from wrinkles and creases. Often, they’ll throw in an extra yard or two of paper, to make up for the unusable paper. This time, they didn’t bother. 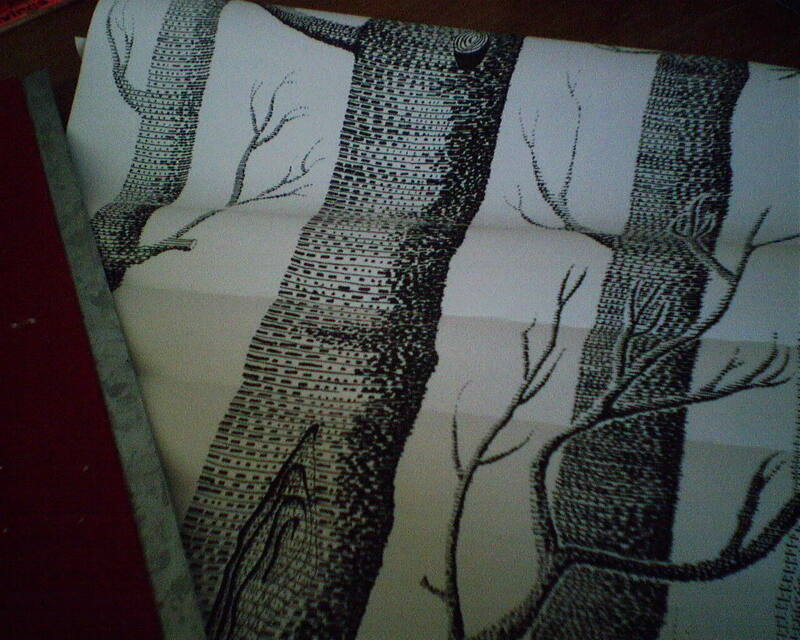 This pattern is “Woods,” by the British manufacturer Cole & Son. 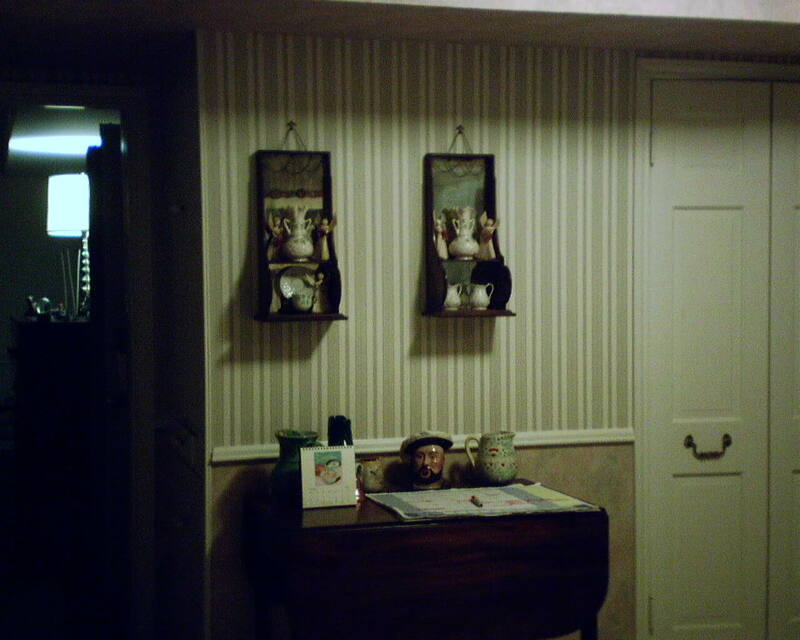 Here’s one more picture of that finely-textured grasscloth wallpaper, in a dining room in the Memorial area of Houston. 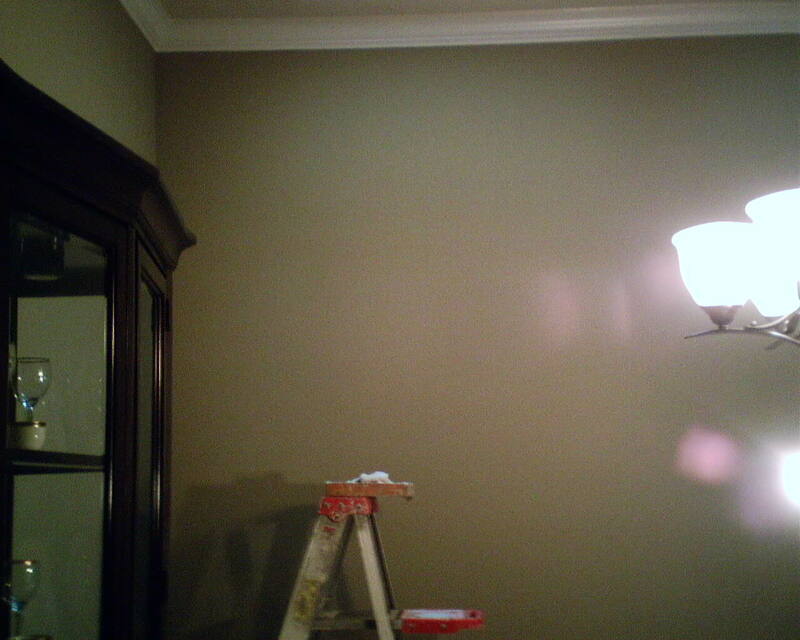 The dot in the center is an electrical box, where a wall sconce light fixture will be installed later. You are currently browsing the Wallpaperlady's Blog blog archives for November, 2013.